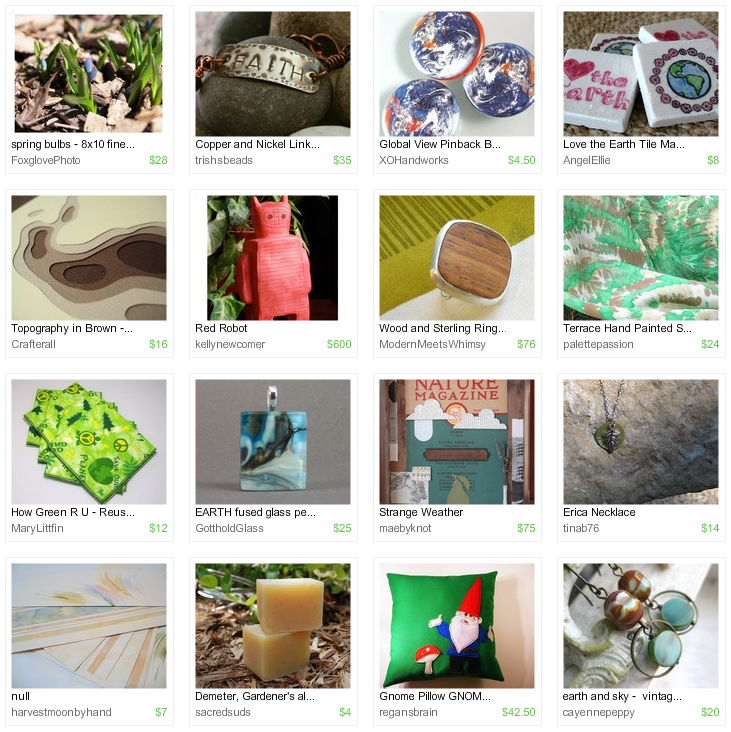 HandmadeMN is holding our first ever Spring Market on Saturday May 8! Over 45 artists and crafters will have booths set up at the Ballentine VFW in Minneapolis. We will have a wide variety of items for sale that day including jewelry, knitted and crocheted items, photos, paintings, notecards, quilted items, and much, much more. Between now and May 8 we will be featuring all of our artists participating in our Spring Market so tune back in often to see all that will be offered! 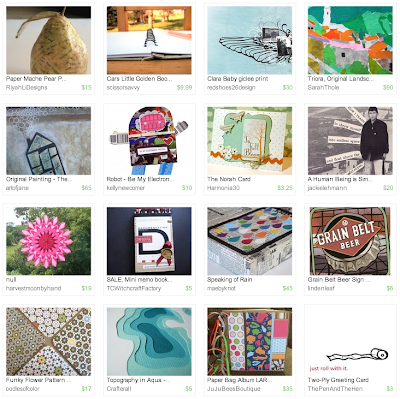 Here are a few more of our artists who will be at the Spring Market! Kathryn of SweetGracies makes One Of A Kind (OOAK) outfits for babies and children! Kathryn has made this lovely dress from a 1950's vintage pattern using designer cotton fabrics in three coordinating patterns. Kat of Katjojo designs and creates cardigans from repurposed secondhand wool, cashmere, angora, and acrylic sweaters. And look at this Illustration that Elizabeth has in her Elizabeth Hurley's shop! Christy's passion for needle-fleting is evident in all of her purses, clutches, accessories, and framed pieces. Check out her creations at CBino. At MissBAccessories you will find Valerie's wonderful collection of handcrafted finery for the small people in your lives. At Jodi's pinswithfury Shop, you will find hats, purses and totes! Bags, purses, journals and home accessories with a contemporary design can also be found at Michelle's Fennel Studio. Thanks for stopping by and hope to see you at our Spring Market! And remember too that we will have a drawing at the Spring Market for our Giveaway Baskets! Contents of each basket are homemade items donated by HandmadeMN team members! That's it for now... stay tuned for regular updates on our Spring Market. Mark you calendar now for May 8! We love jewelry. It's so personal, a reflection of what we stand for or who we are. Designs catch our fancy because of our personalities. Jewelry given as a gift marks a serious relationship. That said, what could be even more personal? Personalized jewelry. 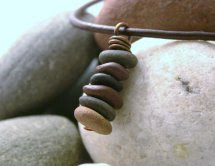 Kristin at one9designs puts her personality into the personalized jewelry she makes for you. 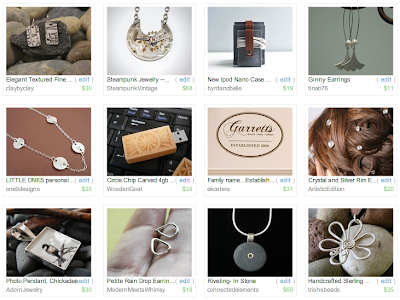 She takes sterling silver and hand stamps your mark into pieces you can cherish forever. So pure and simple, yet so meaningful and beautiful. Take a look at this adorable necklace for the pet lover. 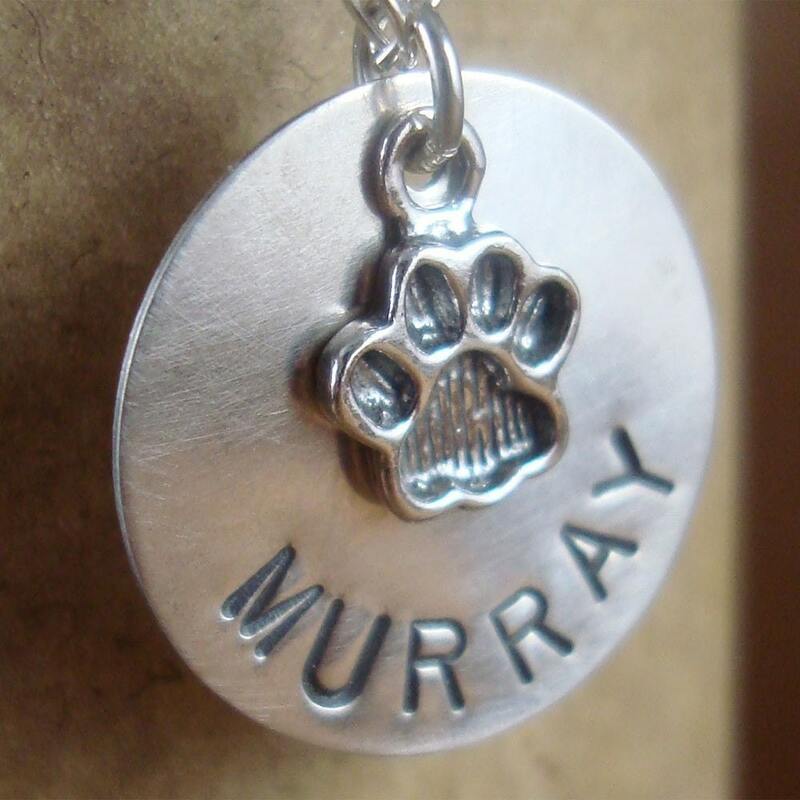 A cute little paw charm along with a silver disc with the name of your pet. Don't forget the jewels. 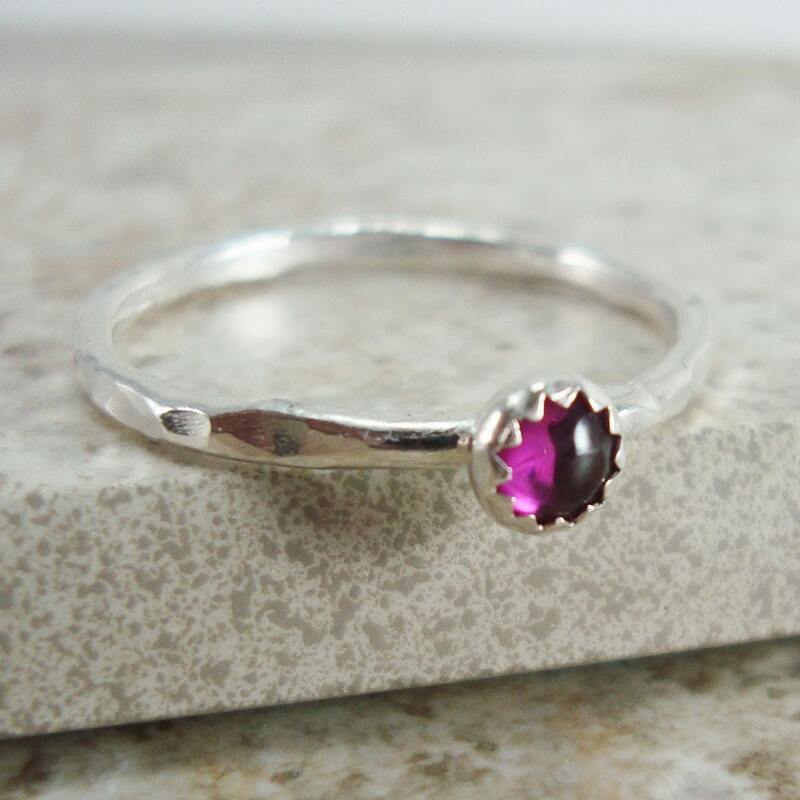 Here is a dainty ring of sterling silver, personalized with your birthstone. I just love the starburst bezel. This one is all swirly and girly. 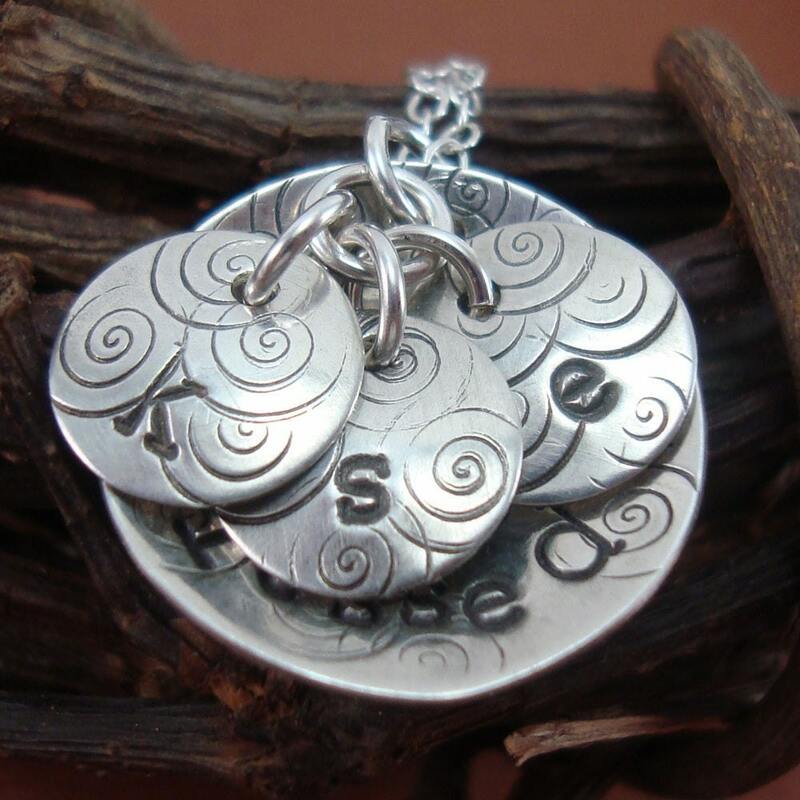 Silver discs stamped with the letter you want to represent your kids or whatever else suits you, along with a bigger disc stamped with the word "blessed." I think it's my favorite. What makes one9designs even more special is that Kristin will adjust her shop listings to fit exactly what you're looking for. In other words, she'll make it as personal as possible, just for you. She's nice that way. Visit one9designs and get something really beautiful, really meaningful, and really personal. Here is our featured HandmadeMN artist Lindsay Fox from Chickadeesigns where she creates fun, funky and chunky jewelry, mainly resin pieces with a mod flair. You can also check Lindsay out on her blog or Facebook Fan Page. For this particular piece, Lindsay's inspiration came from an iPod commercial where the music starts playing and these patterns start growing from the bottom of the screen. Lindsay says, "I took that idea and ran with it. 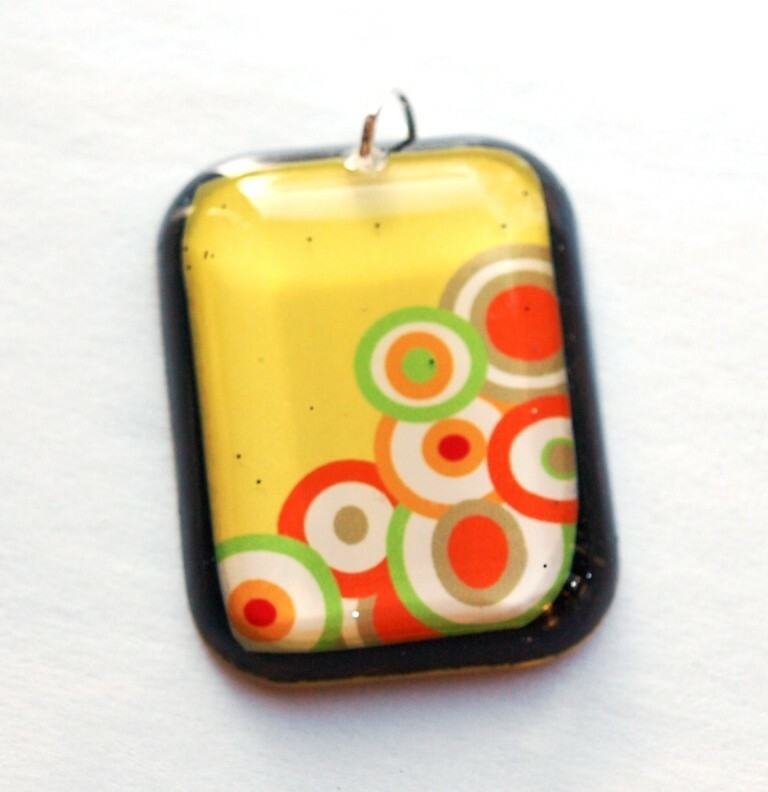 For me, the pattern that grew from the bottom of the art is the brightly colored, mod feeling circles!" This week's giveaway is from Kathryn of Sweet Gracies. She is giving away this lovely wristlet for your little girl, perfect for a day of shopping with mom! This children's bag measures 6" x 5" with a wrist strap and a zipper in the back. It features an adorable pale green fabric with little animals and has a coordinating dot fabric inside. The ribbon and trim details on this wristlet are darling. Contest ends Saturday, May 8, at 12:00 noon Central. One winner will be chosen by Random.org. Events Roundup: Kick off Springtime and Support Your Local! We've got a big weekend ahead of us here in Minnesota's capital city of St. Paul, and a lot of events that won't take more than a bus ride or a choice parking space and a good pair of sneakers to visit. Here we go! This tour of the Lowertown area of St. Paul covers three of my favorite things about St. Paul: the access to public art, free shuttle rides, and cool old buildings and spaces. It's a fantastic opportunity to meet local artists and see where they work, what they do, and how they do it. Kudos to all of the artists to have opened up their studios to any and all who come by - I'll try to stop by this Saturday or Sunday! 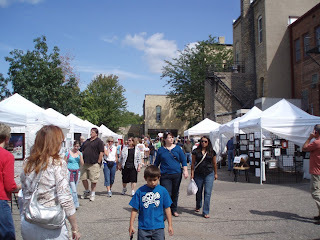 The St. Paul Farmer's Market opens this Saturday, 24 April, for their 2010 season! They'll be open until the end of November. Hey - if you're already in Lowertown for the Art Crawl, check it out! Grab a bag of fresh-from-the-garden produce and head into a warehouse to check it out. There's also great people-watching, a good selection of produce and fresh flowers, and occasionally street musicians and performers. Check out the website for more locations and dates. 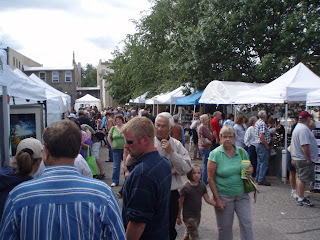 Farmer's markets are a great way to support the local economy, and stay a little more green. Buying local cuts down on shipping and production costs. And it's good for you, too. I know I was highlighting St. Paul, but don't be afraid of the twin across the river. On Saturday in Minneapolis, MNfashion Week is sponsoring the Alter/Nation event, promoting the creative reuse of garments otherwise thrown away or forgotten in the back of the closet. CounterCouture hosts, along with Ever After Gowns, Anthem Heart, Yelp, taj salon & spa, Je Ne Regrette Rien and I’ve Got Your Style, with the help of volunteers. The event includes, but is not limited to, a clothing swap, formal dress donation, on-site tailoring and alterations, fashion shows, live screen printing, and even hair and make-up. Check out the link (above) for more info on the Facebook event page! MNfashion Week is going strong! At any rate, even if it's raining, there's plenty to do! So go out, explore the capital and its twin, and support your local! Fun Friday Finds ~ It's a Pirate's Life for Me! Meet Trish Watzke of Elk River, MN. Elk River is about 40 miles north of the Twin Cities. Trish has been married for 21 years and is raising two teenagers, a daughter who is 18 and a son who is 16. She also works as a Business Office Manager. 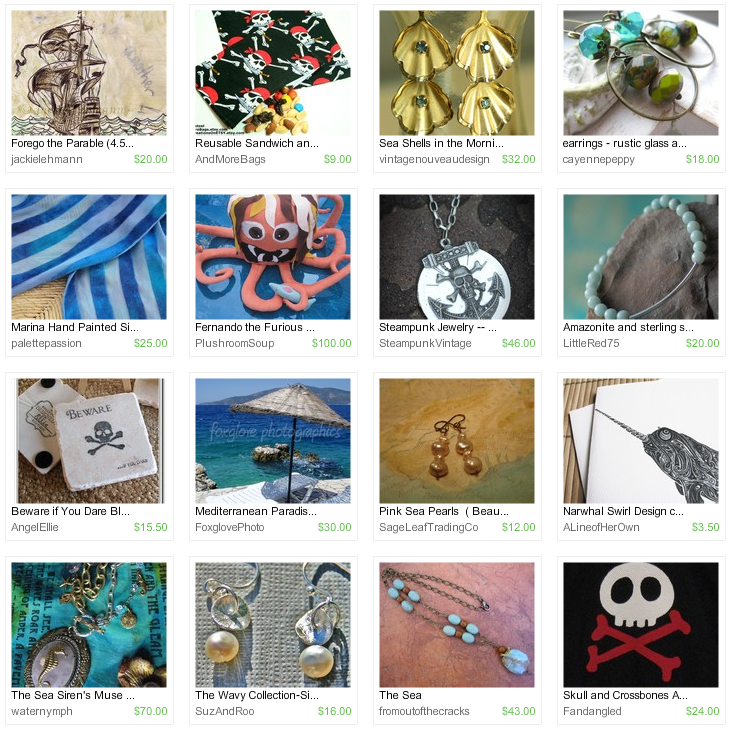 You can find Trish at her Etsy store, Trish's Beads & Bangles, or her blog of the same name. Handmade custom jewelry. I work mainly with Copper, Sterling Silver, and Nickel. Nature, textures and looking at all the beautiful stuff on Etsy and searching the web. I have a makeshift studio set up in my basement next to the washer and dryer, kinda crowded but its mine. I love going down there and sitting at my table to work and create...I have come along way from just creating at my kitchen table, it is really nice not to have to pack up to have the family eat supper. I have always been a crafty person, when I was in high school I enjoyed drawing, and sewing. I have been making jewelry since 2003. No, now I am just strictly jewelry. My husband is a rock hound, so I do help him hunt for agates and will soon be featuring some in my jewelry. Well of course, the local bead store is the most handy, Garden of Beads in Anoka, MN, and Storm Cloud Trading in St. Paul, MN. I also purchase a lot on the web, Rio Grande, Fire Mountain Gems etc. Well so far I only have one sale, so this is for sure a work in progress. Just trying to get my name out there. I am enjoying Twitter, I have over 70 followers. Well, I love lulubugjewelry's etsy store, she is very creative. Today's tasty recipe and lovely story comes from Corrin Kaluza of Athena's Little Owl. Corrin says, "This is a recipe I have known and loved for as long as I can remember, thanks to my grandma, Virginia Hoffman. Whenever we head to her house for holidays, birthdays, or just for an impromptu gathering, I'm always secretly hoping that her "beef tips and noodles" are on the menu. To me, this recipe embodies tradition, family, and warmth. It is comes from the kitchen of her late sister, and my great-aunt, Doris. When I asked my grandma for the recipe and for any background on it, I could tell just thinking of it brought back memories of Doris. So, in a way, making this dish keeps Doris close to my grandma's heart. Enjoy this hearty, but not heavy, dish anytime of the year. It is can easily be adjusted to feed varying amounts of people, just keep the proportions the same." -Mix 3 soups together (do not dilute) and pour over meat in an roasting pan or baking dish with higher sides. -serve by spooning meat and sauce over cooked egg noodles. Today we bring you this great Copper Chickadee Pendant from Jessica of Clay by Clay! 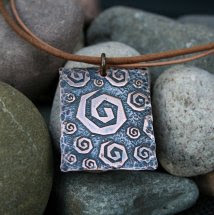 Jessica creates unique handmade necklaces, pendants, and earrings from polymer and metal clay in both silver and copper. This chickadee pendant is hand stamped and texturized from copper metal clay. The piece is dried, filed, refined, and then fired in a kiln! It is approximately 1 inch in size and comes with a 16" copper chain. Open to US and Internationals residents. 7. Follow Jessica's Blog. Leave a comment here letting us know you are a follower. If you are already a follower, leave a comment anyway, as each comment is an entry. 8. Follow Jessica on facebook. Comment back here with your Facebook link. Existing followers just leave your Facebook link here. Contest ends Saturday, May 1, at 12:00 noon Central. One winner will be chosen by Random.org. Here is our featured HandmadeMN artist Cindy Lindgren from Etsy shop Cindy Lindgren where she creates note cards and prints from graphic illustrations inspired by the Arts & Crafts Movement. You can also check Cindy out on her Facebook fan page. Learn how to make handmade flag banners for any occasion! Corrin Kaluza of AthenasLittleOwl will briefly introduce the different types of banners. Then, she will be lead the crowd in making their own banners. According to Corrin, "The story behind my banner is simply this. I wanted a little sign for my shop for an upcoming show, and I loved the look of banners I'd seen on Etsy. However, being a handmade type of gal, I knew I could figure out how to do it myself, and I did. I gathered some materials, and about an hour later I had my banner! I knew that this would be a project that could translate to many needs: birthday parties, holidays, kids bedrooms, picnics, weddings, rehersal dinners, you name it. 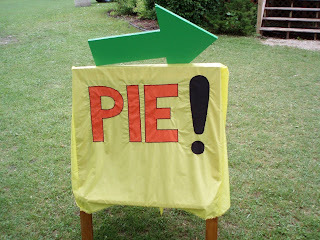 You could make a quick, cute, and inexpensive banner for really any occasion. You can even make your banner upcyled by reusing items around the house (old greeting cards, left over scrapbooking paper, maybe even newsprint/magazines.)" The giveaway this week is for these fun Elvis pot holders from Tracy and Louie, an English Springer Spaniel, of Little Louie Crafts. Tracy does the sewing and Louie picks out the fabric! 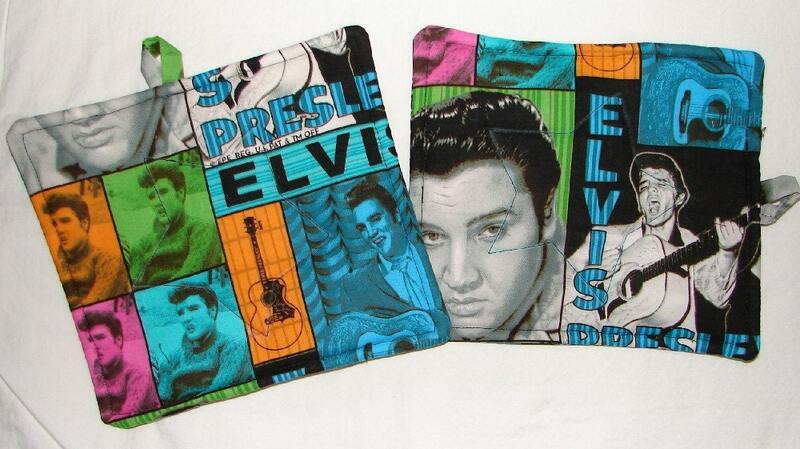 The giveaway is for two colorful potholders featuring the one and only King of Rock 'n' Roll. The potholder set is made with three layers for extra durability: two layers of cotton batting and an internal layer of Insul-Bright, a lining that reflects heat back to it’s source. They also have a handy loop so you can hang them in your kitchen. Contest ends Saturday, April 24, at 12:00 noon Central. One winner will be chosen by Random.org. 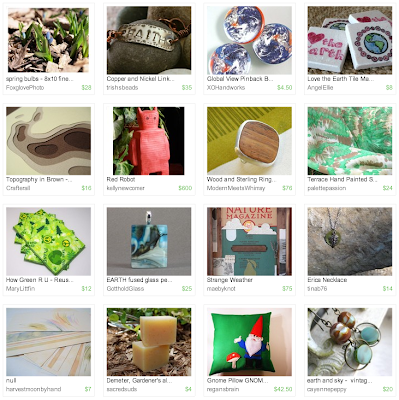 HandmadeMN is holding our first ever Spring Market on Saturday May 8! Over 40 artists and crafters will have booths set up at the Ballentine VFW in Minneapolis. We will have a wide variety of items for sale that day including jewelry, knitted and crocheted items, photos, paintings, notecards, quilted items, and much, much more. Between now and May 8 we will be featuring all of our artists participating in our Spring Market so tune back in often to see all that will be offered! Today we are featuring some of our artists who use paper in their creations! Erin showcases her artistic talent at Penguin Palace Photography. All of her photos are personally signed! And don't we all wish that our gardens would have these vibrant yellow flowers blooming at the moment! Mary of Mary Foster Creative is another one of our HandmadeMN photographers. Did you know that she grows the flowers that you see in her photos? This stunning Lemon Lime Amaryllis is so very beautiful! Be prepared - Before you leave for a show, consider all the things you’ll need to set up your booth, sell and wrap you items. In addition to the routine sale supplies like credit card slips, business cards, and a calculator, remember a small set of tools, first aid supplies, duct tape and spare hardware for any displays that may use special hardware. Being prepared allows you to be adaptable when something unexpected comes up. Don’t forget some healthy snacks to avoid filling up on unhealthy foods just because you’re tied to a small area near your booth. Arrive at the site early - Allow plenty of time to check in, find your booth, cart your display and items to the booth and get everything set up before customers start to arrive. Setting up while customers are trying to shop is bad for your business, appears unprofessional and is distracting for your booth neighbors and their customers. Be a good booth neighbor - Stay within your allotted space. Don’t obstruct walkways or your neighbor space by spilling into those areas. Just as you paid for the space you are occupying, so did your neighbors. Visit with the other vendors during slow period. If your neighbor is alone, offer to watch their both while they use the rest room and they’ll return the favor. If you are going to get a bottle of water for yourself, offer to pick something up for them too. When visiting with other vendors, be aware of customers entering their booth and break the conversation to allow the vendor to greet their customers. Remember that booths are small and the walls are just canvas. Your neighbor can hear everything you say. Be a part of the community - Many shows, especially those in smaller communities, have local service organizations (LSOs) providing services as a fundraiser for the organization. Most commonly, LSOs will sell food or beverages. While it is tempting to bring all your own food to a show, patronizing and visiting with service organization workers is a good way to gain exposure at the show and build goodwill. Buying food and beverages from LSOs at shows is a win/win for me. I need to eat and the community benefits from my purchase. Stay til the end - We all occasionally are in shows that are slow or not what we’d anticipated. Don’t be tempted to pack up and leave early. The disruption of packing up is inconsiderate to your neighbors and an empty booth is very distracting to customers. Don’t be in a hurry to leave at the end of the day. I’ve frequently had my largest sales of the day while the other vendors are closing up their booths and I was one of the few still open. Bonus Tip - If you are one of the fortunate and have a person to help you at shows be sure to show this person your appreciation. For my roadie, all it takes is a slice of pie and a nap in the shade in the middle of the day. Whatever it takes, be sure they know how much you appreciate their assistance. Good luck to you this show season. I hope these tips help you have a successful show. Some of you might be familiar with Renae Redenius of Trigo on Etsy because of her great recycled monster coin purses. Renae loves designing things that make people laugh, but she also enjoys finding new ways to use old materials. One of those materials is wool. Whether the wool is hand knit, machine knit, or even store bought fabric, Renae has learned how to re-create the look and feel of these materials through the art of shibori felting. Shibori felting originated in Japan. It is a felting method which uses small objects like buttons, beads, or pebbles to add texture to woolen materials before it is felted. 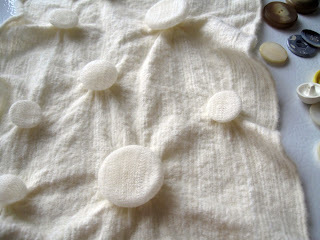 The wool can also be folded and secured to create interesting accordion effects. In her demonstration, Renae will give step-by-step instructions on the shibori felting method. She will also share ideas for different projects.